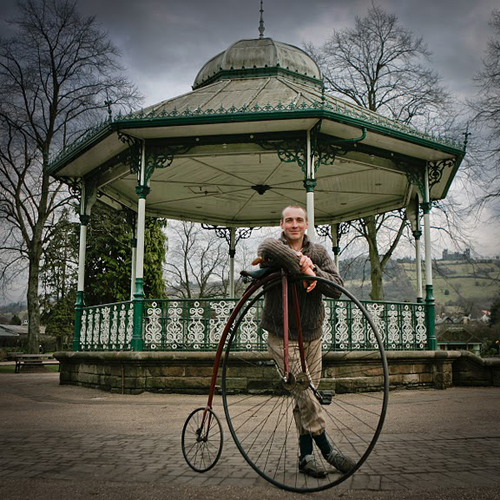 This September, the leafy avenues of Matlock’s Hall Leys Park will be filled with the considerable whirr of wheels up to 56 inches in diameter when as many as 30 penny farthings hare along in a race to help mark the park’s centenary year. 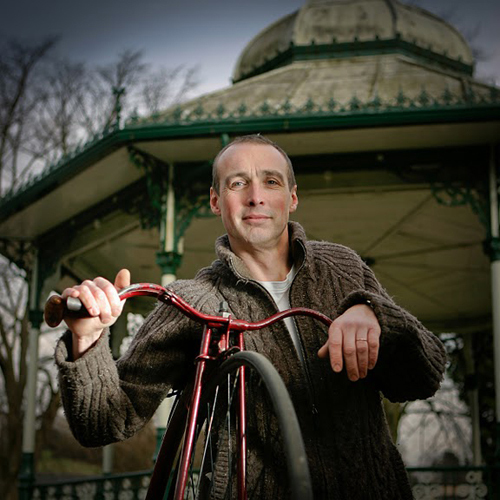 Organiser Richard Thoday has the backing of the local authorities for his novel plan, and ‘Pennies In The Park’ has already got cycling enthusiasts chattering online, with word crossing the Atlantic within hours. 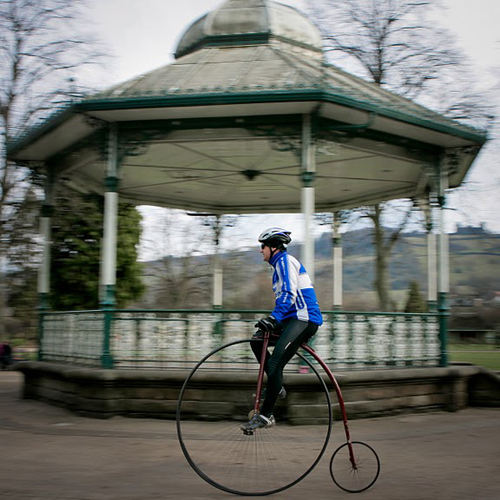 As you might imagine, penny farthing races aren’t exactly, er, ten a penny, but they do have an eager- and international - following. 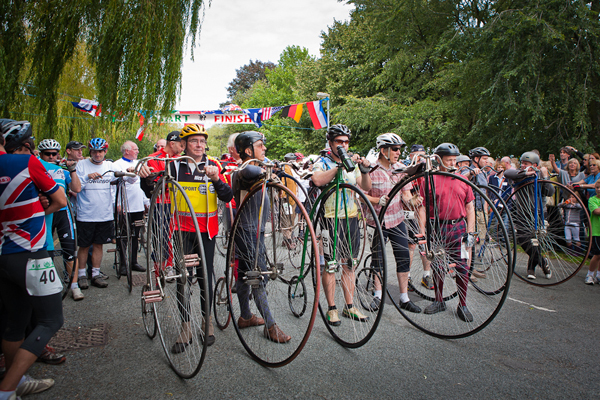 Last year, the Knutsford Great Race, just over the border in Cheshire, included an event for the old ‘high-wheeled ordinaries’, as they were also once known. Entrants travelled from as far as New Zealand for the chance to compete on these evocative machines, which were being raced at the event for the first time in a decade. It was lycra and helmets rather than tweeds and deerstalkers in the main, but the spirit of derring-do was still clearly evident. 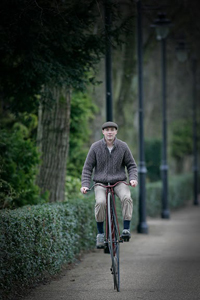 For it was speed that earned the penny farthing the affection of cyclists across Europe and North America following its emergence in the 1870s.The huge front wheel and its solid rubber tyre also made lighter work of cobbles and ruts than the earlier ‘bone-shaking’ velocipedes.But the seating postion, right over the front axle, would present the greatest challenge to any.chap or chappess who’d skipped up to the towering saddle. Hitting a pothole or even breaking hard on uneven ground could send the rider tumbling head first to terra firma. Occasionally, it proved fatal. The debate that once shrouded its invention seems to have been decided in favour of Frenchman Eugene Meyer and his ‘spider wheel’ design, while Coventry engineer James Starley chipped in with the spokes and the mounting step. In the 1880s, English-born Tom Stevens set out from his new home in San Francisco and cycled east, calling it a day when he reached Yokohama, Japan, 17,000 miles later. 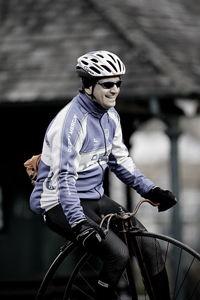 But by the 1890s, safer, lower bikes were back in fashion and the pneumatic tyre had made the whole cycling experience a deal more comfortable. No one much fancied inflating a 60-inch inner tube and high wheelers had had their day. 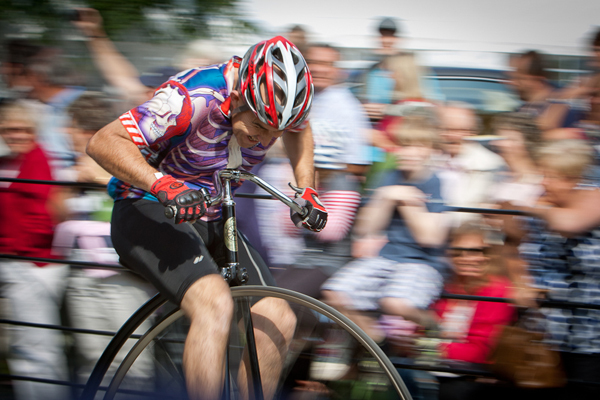 His passion for the old high wheel has been simmering for some time, having tested them on one of only two four-cornered tracks left in Britain, at Forest Town, near Mansfield. But it was competing at Knutsford that helped him understand just how widely-shared his interest in this oft-lampooned contraption was. 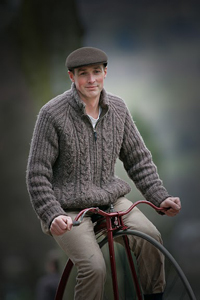 There is already a full programme of events for the day – Sunday 11 September – all about cycling, but it’s not all about the bike. There will be bike polo on the tennis courts, run by Bike It!, British Cycling’s Go Ride team will be staging a series of youth races before the main event. Roller racing – a test of speed, balance and stamina - will be run by the Derby Mercury club, while a microscooter race and perhaps even some freestyling by users of the park’s skateboarding and BMX area could also feature. Also backing the day is the Peak District National Park Authority which launched a programme to encourage people back on to bikes last year. “The way I see it is to fill the park with as much bike riding stuff as we can that involves as many people as we can, just get people generally interested and involved with things to do, “ said Richard, The main event will close the day, preceded by practice sessions in the morning and timed laps to seed the ‘penny grid’. 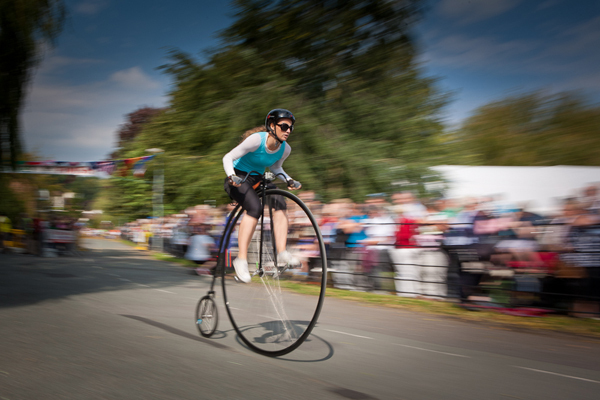 For anyone who fancies seeking out the literal highs of penny farthing racing, Richard has some handy tips. 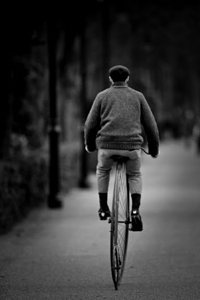 “Practice with the bike. Get used to getting on and off it, and then relax,” he says. “And if you fall, make sure it’s into the hedge and not into the crowd. Pennies In The Park, Hall Leys Park, Matlock. Sunday 11 September 2011.